The goal of the Agent Charitable Fund (ACF), when it was announced at Convention in February, was to end hunger in Michigan. The ACF took another step toward that goal thanks to the generous donation of a ‘reefer,’ or refrigerated trailer, by Farm Bureau members Jerry Jr. and Diane Kuehnlein. Jerry and his wife, Diane, own a farm and trucking company in the Monroe area of Michigan. Agent Mark Jarrait, of Monroe, and an ACF board member, wasn’t surprised when they stepped up to help. Jarrait says that agent Merrick Maris and the rest of the ACF board are in the process of securing 10 refrigerated trailers that will be donated to the Food Council of Michigan as part of a regional strategy to ensure that Michigan’s children have access to food that’s healthy and nutritious. The reefers will be connected to semi-trucks and branded with Farm Bureau logos and information about the Agent Charitable Fund. The trailer donated by the Kuehnleins is expected to begin delivering food in August. It’s all part of the process as the Agent Charitable Fund continues to gain momentum. When the ACF was announced, agents around the state jumped into action and pledged more than $500,000 in support of its mission. Statistics show 15 percent of Michigan residents and 18 percent of all children considered food insecure. 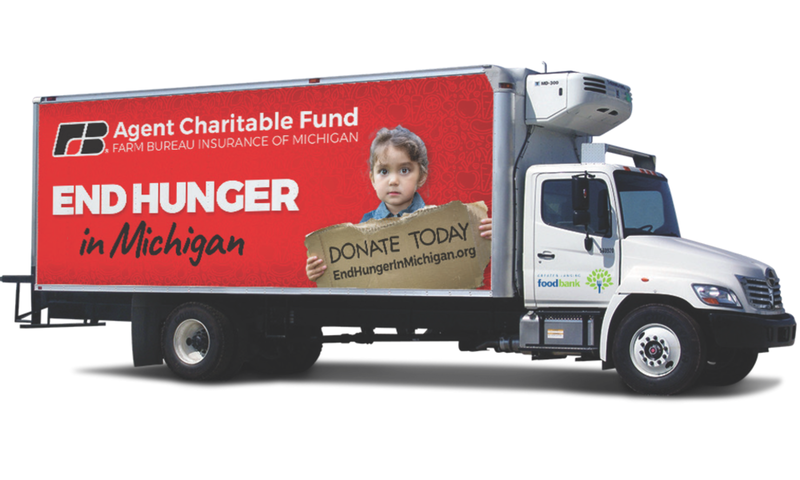 ACF seeks to aid approximately 3,000 hunger-relief agencies across Michigan through a variety of means and education.